28/6/08 — Discovery — Rembrandt — In October 2007 (see news item of 29/10/07), we pointed out the appearance, in a small British auction house, of a portrait representing Rembrandt but ascribed to one of his “followers”, which sold for £2.2 million. Obviously, the buyer was convinced of having bought a work by the master himself, an attribution that, using due caution, we were hesitant to acknowledge. In any case, the portrait was presented as an authentic Rembrandt from 7 to 29 June 2008 at the Rembrandthuis in Amsterdam. The work had been engraved around 1800 under the name of Frans Hals, but some historians in the early 20th century, had already put forth Rembrandt’s name. The painting was examined by the Rembrandt Research Project, the institution which is considered the final authority on the artist and which has thus stated that it is an authentic painting dating from around 1628. 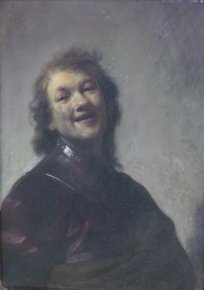 It has been given the name of Rembrandt Laughing .